Butler studied architecture and later became an Associate of the Royal Institute of British Architects. A Conscientious Objector during the war, he ran an engineering workshop, repairing and making tools and spare parts for agricultural machinery. In Spring 1948 he was briefly an assistant to his neighbour Henry Moore and later that same year began to make his own metal sculpture. 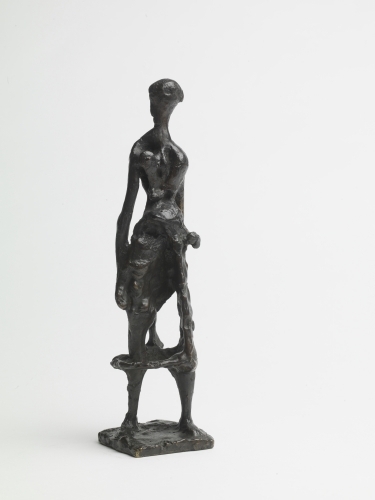 In 1949 Butler held the first of five solo exhibitions at the Hanover Gallery, London. He first showed at the Venice Biennale in 1952 and the following year won the prestigious ‘Unknown Political Prisoner’ competition to design a monument for Berlin. Technically skilled, he devised his own thin-shell casting method and realised many of his own bronzes. Throughout his life, his main preoccupation and the focus of his work was the figure, which later became exclusively female. His sculptures often incorporate metal frameworks or cages which hold the figure in space, contrasting with the soft vulnerability of the modelling. Many are doll-like or have a fetishistic quality and Butler himself saw his female nudes as being in the same tradition as the Venuses of Willendorf and Lespugue. Butler’s work is found in most major public collections worldwide and Tate held a memorial exhibition of his work three years after his death.